Full Tilt is a multi-platform gaming company with over 23 million registered users. 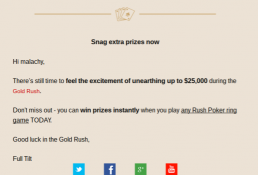 Gold Rush was the most successful promotion at Full Tilt in 2014 and I worked on the project from conception to completion. A new mini-game was introduced to all mobile and desktop platforms for the duration of the promotion, rewarding users for playing Full Tilt’s flagship game Rush Poker. During this complex project, I worked with dozens of stakeholders including software developers, marketing experts and UI designers. I delivered press releases, a suite of targeted emails, landing pages, rules pages, in-client messaging, mobile push notifications, pop-up messages and more for this project.